Joecon 2010 interrogator preview is up !- BLOOD FOR THE BARON!!! So who is behind the mask ? Looks good the thing is when they reveal the face will we be any the wiser? Ironblood wrote: Looks good the thing is when they reveal the face will we be any the wiser? 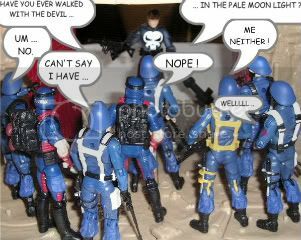 interrogator didnt come with those legs originally... maybe a red herring / coincidence / cost cutting exercise / ease of moulding or a tie in to the shadows... yojoe describes him as an international terrorist and colllectors club asks what hes hiding in the mountains of germany?? Was his helmet Ironblood shaped before? Not saying it's the same but very similar. paul463 wrote: Was his helmet Ironblood shaped before? Not saying it's the same but very similar. "Was his helmet Ironblood shaped before? Not saying it's the same but very similar"
Looks like he has a bucket stuck on his head as well! Sorry but good figure let down by crap helmet!